Emperor Paul I added a Lifeguards Jager battalion to the Russian Imperial Guard in 1796. A second battalion was added forming the Lifeguards Jager Regiment in 1806. Also in 1806, a Imperial Militia Battalion was raised from peasants residing on crown lands. Nafziger says this unit added a second battalion in 1807 and was renamed the Finland Guard Regiment. Viskovatov states that the Battalion was renamed the Finland Guards Battalion in 1808, and became the Lifeguards Finland Regiment (of three battalions) in October 1811. The Lifguard Jagers originally wore a light green uniform similar to the line Jagers, with orange collar and cuffs bearing yellow litzen. In 1807 the uniform changed to dark green, with orange piping on the collars, cuffs, and shoulder straps; black belts. The Finland Regiment was also uniformed as Jagers, but with red piping on the collars, cuffs, turnbacks, and shoulder straps. Here's the first battalion of the Lifeguards Jagers; actually, initially none of the men wore the tall plumes, but instead just the pom-poms, but when the Grenadier (or Carabinier) companies were raised (1811) it seems they did have the tall black plumes. I have chosen to give all the companies the tall black plumes, just, well because it m,ore readily distinguishes them form the line Jagers. Black leather belts, etc, were worn (instead of white), again like the line Jagers. The regiment had yellow litzen (guard lace) on the button holes of the collars and cuffs; the drummers and hornists had red plumes and yellow lace shoulder wings and chevrons on the sleeves (maybe with a thin red line down the center of the yellow lace/tape). This is the second battalion; aside from the color of the pompoms of the Jager companies its uniform is pretty much identical to the first battalion. The Lifeguards Finland regiment evidently had red lace with a thin black line down the center. Note the orange stripes on the green pants. 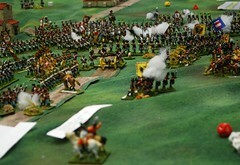 Both units are Falcon Figures purchased at Historicon a year ago to make the Guard Jager contingent for our Borodino game next month; I like the "standing, firing" position for Russian Jager units, where possible. I've also finished and based 40 Russian artillery crew; just need to do the cannons that go with them, plus a French Guard Horse artillery battery, which is 60% finished, and I'll be all set for Historicon! 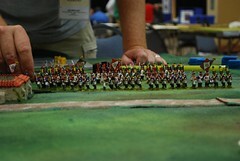 Scale: 1 Infantry unit = 900 men, 1 Cavalry unit = 600 men, 1 Artillery unit = 6-8 guns Allied, 12 guns Russian. Table Size: 6 x 10 feet; 1” = approx. 60 yards. Background: Russian General Kutuzov learned on October 22nd that Napoleon’s Grande Armee had abandoned Moscow on the 19th. The French were marching south to Kaluga. Retreating on a southwestern route would allow the 100,000 survivors of the Grande Armee to find warmer weather and traverse land not yet ravaged by the brutal 1812 campaign. To head off the French columns and force them to turn west instead of south, Kutuzov ordered 13,000 men under General Dokhturov to stop the enemy from crossing the Lutza River on the road to Kaluga. After an all-night forced march, Dokhturov’s corps arrived at the village of Maloyarslavets at dawn on October 24. They drove a small French vanguard from the town but could not dislodge the French from their precarious bridgehead on the river bank. At 10:00am, Prince Eugene’s IV Corps began to arrive in force with the intention of recapturing the town and opening the road to Kaluga. Map: The Lutza River may be crossed in column formation via the bridge. The River is otherwise Class III terrain and crossable only by Infantry. In addition, when (infantry) units are in the center of the river and attempting to move to the riverbank, each unit must roll its Defense Die type. On a Roll of “1”, the attempt fails, and the unit loses 1 UI (no morale Point cost for this loss); on a roll of “2” or “3”, the attempt fails and the unit remains in the icy waters. On a roll of “4” or more, the attempt is successful, and the unit is placed on the far bank, Out of Command. 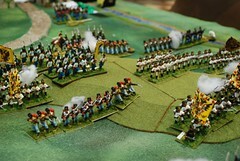 The tributary stream counts as Class II terrain, but is impassable to artillery. The hills are Class III Terrain for movement (and melee if enemy is in class I terrain), the woods Class III. All buildings are class II terrain, except the fortified Church, which gives attackers a DOWN 2 for fire, and DOWN 3 for melee. Scenario Rules: To reflect the combination of their poor firepower but great stoicism, Russian Line and Jagers, although Regulars, will have a Defense Die of D8 but Line will have a Combat Die of D8, and Jagers D10! 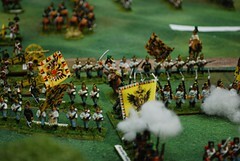 Cossacks only cost a Morale point when they are completely destroyed or routed (in which case the unit is removed immediately). The game ends when one side fails Army Morale. Control of each of the two town sections of Maloryaroslavets also subtracts 1 Morale point from the opposing player's total; another 1 MP per building in Maloyaroslavets is subtracted from the opposing player each time they change hands. Allied Reinforcements: All French reinforcements enter at or within 18” either side of point "A." PINO arrives on the first French MOVE card. LECCHI, TRAIRE and PREYSING arrive on the second French MOVE card. GERARD arrives on the third French MOVE card. All reinforcements enter in the formation(s) of the player's choice. VASILCHIKOV arrives at or within 18” either side of point "C" on the first Russian MOVE card. The remainder of RAEVSKY’S corps arrives at the same location on the second Russian MOVE card. KUTUZOV arrives with his heavy artillery reserve at or within 6” either side of point "D" on the fourth Russian MOVE card, but he and his guns must remain within 12" of the southern board edge. * = control means you either occupy both buildings, or there is no enemy within 6” of any unoccupied buildings. Scenario design notes: This scenario (and map)was adapted for Field of Battle from the scenario for Age of Eagles by GRW. ** French Legere, Italian Light Infantry, and the Provisional Croats may Skirmish. On October 22nd, 1812, Russian General Kutuzov learned that Napoleon’s Grande Armee had abandoned Moscow on the 19th. The French were marching south towards Kaluga. Retreating on a southwestern route would allow the 100,000 survivors of the Grande Armee to find warmer weather and traverse land not yet ravaged by the brutal 1812 campaign. To head off the French columns and force them to turn west instead of south, Kutuzov ordered 13,000 men under General Dokhturov to stop the enemy from crossing the Lutza River on the road to Kaluga. After an all-night forced march, Dokhturov’s corps arrived at the village of Maloyarslavets at dawn on October 24. They surprised a small French force in the town, and drove them out. However, the Russians were unable eject the French from their tenuous bridgehead on the river bank, anchored by the fortified brick church that dominated the approaches to the bridge. At 10:00am, Prince Eugene’s IV Corps began to arrive in force. The Viceroy planned to recapture the town and open the road to Kaluga. We did this playtest game in my basement on June 3rd of this year to evaluate the scenario planned for Saturday at Historicon in July ("The Road not Taken"); I'll be posting the revised scenario subsequently. 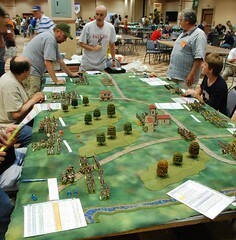 It was adapted from a 2008 scenario for Age of Eagles by GRW. Greg, Joe, and Czar Barry (of course!) commanded the Russians, while Matt, James, and I had the French. The majority of the table is Class III terrain, and to make matters worse for the French, the Lutza river flowed swiftly through a deep ravine, and is also rated class III, with a chance of infantry fording it losing Unit integrity in the process. The river is completely impassable to Cavalry and artillery, which may only cross by means of the single bridge. The Russians seize the initiative at the start of the game, and pull 2 MOVE cards in quick succession, reaching the small town of Maloyaroslavets, which sits on a hill surmounting the rugged terrain of the plateau. The lead Division of Eugene's Corps will have its work cut out for it today! 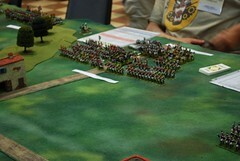 Overview of the table after the uncharacteristically adroit advance by Dockturov's men. 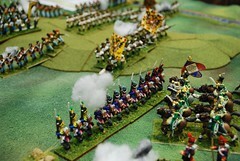 Still more Russians converge on the battlefield - a veritable cloud of Cossacks! "Excusez-moi, mon général Pierre, mais la rivière est infranchissable de cavalerie, est-ce pas ?" "Quelle idiote je suis ! Non seulement notre propre cavalerie ne peut pas traverser la rivière, mais ne peut les Cosaques maudits ! Division - flanc, mars à gauche!" After losing control of the town to the Ruskis, and confronting severe traffic management problems, it becomes clear to Eugene and his Divisional commanders that the infantry must brave the frigid waters of the Lutza river, and reserve the bridge for use by the Artillery and cavalry! 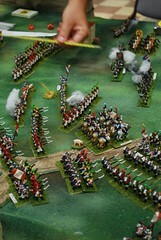 Greg and Barry move up more Russian reinforcements, and send them at the beleaguered town! The slow process of fording the river allows the 3rd French Division to advance on their left, supported by the Corps Reserve Artillery, and take the pressure off the center, where several assaults upon the town by the Provisional Croatian regiment are repulsed by the Russian defenders with losses. Fontanelli's Italian Division arrives to bolster the weak French Center and Right. The French (well, Italians, actually) manage to take back part of the Town. Overview of the battle from the French left - James makes good use of a favorable sequence of cards to move, volley fire, use support fire from his artillery, and then charge! This exposes Kutusov's own Artillery Reserve, just entering the table. The action on the French right and center heats up as they surge forward, trying to create some breathing space for deployment and maneuver. In the foreground, the Grenadiers and Conscripts of the Italian Guard have finished traversing the river, and are providing flank support. On the French Right, Fontanelli (Matt) moves forward boldly, perhaps some might even say rashly, but his Italian Light Infantry handles the enemy Jagers handily. The small contingent of elite Dragoons of the Italian Royal Guard can be seen in support. At this point, the hour was getting late, and we had learned what we needed about the tweaks required to make the scenario run more smoothly and keep all the players involved in the action. Prior to James' sweep on the French Left and Fontanelli's counter attack on the right, the French were getting hosed in Morale points. What a difference the right cards coupled with aggressive play (and hot dice) can make; by this point, Morale Point losses were just about even again... still plenty of play left on this table, even though we called the game to allow for travel back home for the players. Myself, I'm back to painting Russian Guard Jagers and Artillery - less than 5 weeks to Historicon. Hope to see some of you there! 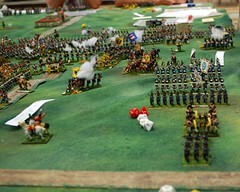 With our Borodino game next month planned to have more than 3,000 figures, 14 players, and even a few more Corps than that per side, keeping track of the various command groups and their units and officers on the tabletop becomes a significant issue. 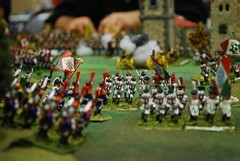 Rather than use the variable troop ratings which are standard practice with Field of Battle, we generally use standard ratings for all the troops in or Convention games. This keeps things simple for the players an umpires, and with the variety of troop types on the table, the spread of various Defense and Combat die types becomes fairly broad anyway. That still doesn't help the players keep their forces straight, so for really big battles like Borodino, we're using "Command Cards", which list each Commander with his Leadership rating, and all the troops in his command (usually a Division of 2-10 units; each player will have several commands to run, usually comprising roughly a Corps), with their ratings. A separate card lists the Corps Commander, if any plus any attached troops (usually the Corps Reserve Artillery), and the total Morale Points his command can lose before having to roll for Corps Morale on the dreaded "Army Morale Check" card. In addition, each card is color coded to show the Corps and Division, plus aid in identifying the various commanders on the table top. The bottom of each card is the color assigned to that corps, and each Division has its own color on the top. Corps Commanders have the Corps color on the top and bottom of their card. Each Command figure on the table top has their own label, carried on a plastic base in the Corps color. The label has the Commanders name and Leadership rating on the top, and the name of his command on the bottom. In addition, there are two colored boxes on the right side of the label - the upper one on the Division's color, the bottom in the Corps color. Another shot from the enemy's view. Any thoughts about this? Good weekend painting so far... everything remains on track for July! Prince Eugene de Beauharnais, Viceroy of Italy, has been placed in command of all the French and Italian troops in the Northern Italian theater at the start of the 1809 campaign. Eager to impress his imperial step-father, and contrary to his written instructions for the campaign, he unwisely attacks the Austrian Army of Italy under Erzherzog Johann before his own army has completed concentrating. With the swift-flowing River Licenza to his back, and only one bridge over it for retreat in the event of a defeat, even his unskilled opponent, Erzherzog Johann (Archduke John), can see the opportunity to inflict a sharp defeat upon the hated French! 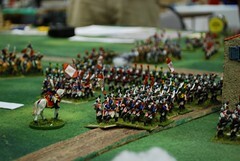 Herman commands Grenier's Infantry and Sahuc's Cavalry Divisions. Jim begins the advance with Broucier's Division, stationed on the French far left flank. "Up one for Point Blank range, Down 1 for firing from Column, Up one for firing at Column, that's a net Up One - roll a D12!" Marziani's strong Division has been pounding Seras' troops on the far French right. Intense fighting around the church at Porcia. Fontanelli's Italians advance as well. Grenier (near) and Broussier (far) descend upon the refused Austrian right flank. Frimont's Hungarians and Grenz have repulsed the first attack with heavy losses! There seems to be no stopping Marziani's steamroller attack; if they get much further, they'll over run the French battery. but Serras manages to form one last thin defensive line. Fontanelli's Italians have routed one Austrian Hussar unit, but the other has charged one of their columns and destroyed it! The Austrian right faces threats from two different directions. As Broussier's division reaches engagement range, the Austrian Right is heavily pressed. The hinge point of the Austrian right is pierced! Overview of the battlefield at the point where the deck has been played through and shuffled - and BOTH armies are at Zero Morale Points! View of the Austrian Reserves headed to bolster their Right. No question those reserves are needed, and soon! 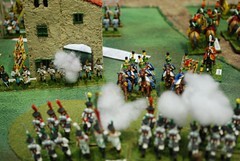 Austrian Hussars routing from Italian Infantry firepower! 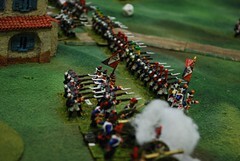 At the height of his success, General Marziani is struck down by a stray musket. ball! At this point, the game was incredibly tense,as each side desperately sought to inflict losses on the enemy, so that when the dreaded Army Morale Cards were turned, they would have Morale points, and their opponent would not. 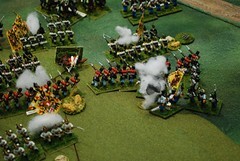 The side with the Morale points shifted back and forth with the cards, but when Marziani's untimely death placed his entire large Division Out of Command, the Austrian tide ebbed, and the French slowly gained the advantage. When the Austrians finally turned an Army Morale check card, they failed their roll - game over! IIRC, the French had no more than 1-2 Morale points themselves at that point, so it could easily have still gone the other way. 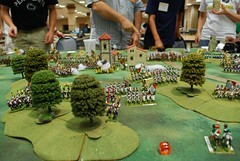 This action was played out on Saturday night at Historicon, July 2010, in Valley Forge, PA, using Field of Battle rules by Brent Oman. The excellent photos used here were all courtesy of Gabriel, who commanded the Italian Division for the winning cause. There were five players a side, and the game was very tense and exciting! At least half the players were new to the rules, but all caught on very quickly, and were great sports. Rather to my surprise, midway through the game we were informed that it had won a GM award for Best of Time slot. 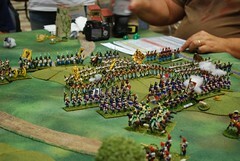 Once again, the judges commented that points in its favor were that it was a big, good looking game, with several teens playing... but they were amazed to see a Napoleonic game where all the players seemed to be having a good time, and most were smiling an joking! All I can say is that we had a great crew of players, and I enjoyed myself at least as much as a GM as they did ! 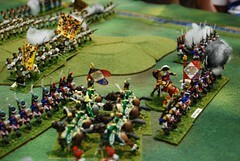 Only six weeks until Historicon 2012... back to painting the last of the Russians!